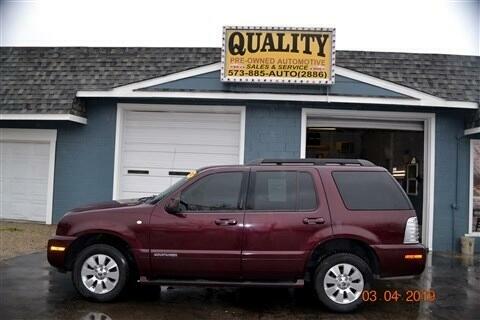 2007 MERCURY MOUNTAINEER(BURGUNDY) 4.0L V6 AWD!! !CHROME RIMS LEATHER INTERIOR. THIRD ROW SEATING. RUNS AND DRIVES GREAT.$8650 . COMES STATE INSPECTED WITH A 30 DAY TEMP TAG. **FINANCING AVAILABLE** COME VISIT US AT QUALITY PRE-OWNED AUTOMOTIVE IN CUBA, MO 65453 OR CALL US AT 573-885-2886. THANK YOU. VISIT OUR WEBSITE THAT PROVIDES YOU WITH ALL OUR CURRENT VEHICLES IN INVENTORY INCLUDING 20+ PICTURES OF EACH - CLICK HERE http://www.qualitypre-ownedauto.com/newandusedcars.aspx CHECK US OUT ON FACEBOOK ** LIKE US & SHARE ** https://www.facebook.com/pages/Quality-Pre-Owned-Automotive/393774484142435 NOTE: The internet price shown is a cash only price and may be subject to change at anytime pending approval by our financial lender(s). Finance charges may apply. APPLY ONLINE NOW! --- https://ssl-wwwqualitypreownedautocom.dcs-cms.com/creditapp.aspx.